Odour Buster™ Multi-Cat is an ultra premium, clumping cat litter made from superior-quality clay. It is our most technologically advanced formula yet! Thanks to the latest manufacturing techniques and our exclusive odour eliminating recipe, Odour Buster™ Multi-Cat is the most dust-free and odour-free cat litter on the market. Odour Buster™ Multi-Cat creates extra-hard clumps quickly that are easy to scoop. Because the clumps don’t break apart, the remaining litter stays clean and odour-free. 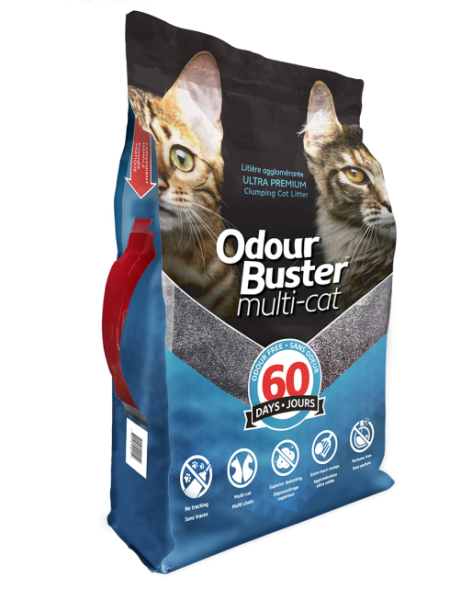 Odour Buster™ Multi-Cat is available in a 12Kg bag with a convenient carry handle. Odour Buster™ Multi-Cat is made from responsibly-mined, premium-quality bentonite clay. Why choose Odour Buster™ Multi-Cat? Odour Buster™ Multi-Cat is proudly made in Canada using premium quality ingredients that are safe for your cat, family and the environment. * Results may vary and are based on daily litter box maintenance. With Odour Buster™ Multi-Cat, your cat won’t leave dusty paw-prints all over the house. Odour Buster™ Multi-Cat eliminates odours efficiently, clumps quickly and is always ready for the next cat. Odour Buster™ Multi-Cat is safe for dust-sensitive cats and humans. Odour Buster™ Multi-Cat creates extra-hard clumps for easy scooping and a clean litter box. 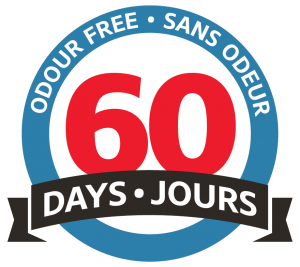 Odour Buster™ Multi-Cat eliminates odours and the need for any added perfume.